It is fair to say that Jacques Haman, born 30.08.1994, is one of the most exciting prospects of Cameroonian football. Although being only 16 years old, Haman is already a regular member of Cotonsport FC, the best team in Cameroon and the current leaders of the MTN Elite One 2010-2011. Jacques Haman is described as a left-winger / left-midfielder or a center forward. My first records of Haman are from June 2010 when Haman was named in the squad of the Cameroon U-17 national football team. He was a regular member of Cameroon U-17 the rest of the year. At this time, Haman was part of the youth team of Cotonsport FC but he was promoted to the first team before the start of the MTN Elite One 2010-2011. I can document that Haman has played 9 of 12 league matches for Cotonsport FC so far this season, but it seems likely that he has participated in the three others as well. Haman has made substitute appearances in some of the matches but he is nevertheless an important member of the first team. Haman has scored one league goal, on 23.01.2011 against Scorpion de Bé. Haman is also making his debut in the CAF Champions League this season. 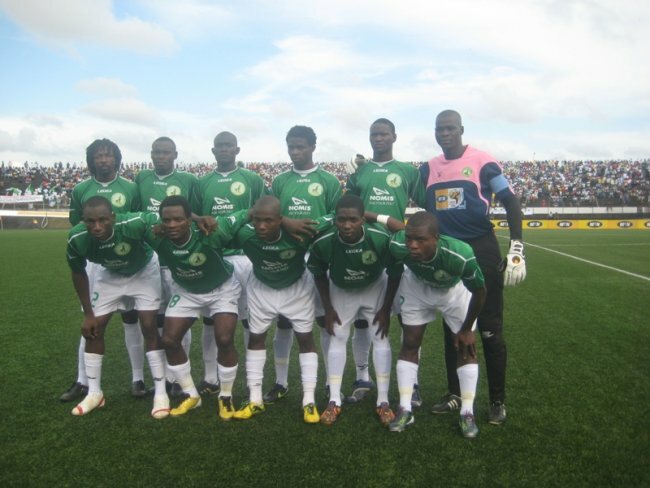 On 30.01.2011, Haman scored two goals for his club in a qualifying match against Vital’O FC from Burundi. His first goal was apparently a beautiful volley. His second goal was apparently a classic goal. According to Burundian match reports, Haman received the ball on the left-wing, dribbled his way past three Vital’O-defenders and hammered the ball into the net. The same match reports describe Haman as a brilliant player with impressive dribbles and lightning pace. On 06.03.2011, Haman scored in the retour match against Vital’O FC, apparently a clinical finish after a beautiful combination. Haman’s goals meant that Vital’O FC got knocked out and Cotonsport FC are therefore ready to the next round. Haman will hopefully appear in the CAF Champions League later this year. Earlier this week, Jacques Haman was named in the squad of the Cameroon U-23 national football team. Cameroon U-23 are preparing for an Olympic Games qualifier against Egypt. It is not often a 16 year old player gets picked for a U-23 national football team, even in Africa. Cotonsport FC are arguably the biggest club in Cameroon and obviously have the financial muscles to buy established players. Their current team consists of players with full international matches for Cameroon (Nicolas Alnoudji), Niger (Amadou Kader, Seidou Idrissa, Daouda Kassaly and Karim Lancina) and the Central African Republic (Hilaire Momi). Cotonsport FC also have several players who are part of Cameroon U-20 and Cameroon B. I find it quite remarkable that a 16 year old boy has played such a major role in a team that, according to Cameroonian standards, is packed with star players. I guess it will only be a matter of time before foreign scouts discover the talents of Jacques Haman. The picture of Cotonsport FC is taken from Camfoot.com. I am the Director of Arcadia Shepards Soccer Academy. We are based in the South West Region . They have to go for trial . Director : Epah Gyavira Fusi.